Issue 27 of Yak Fisher covers lots of Spring options and season starters. 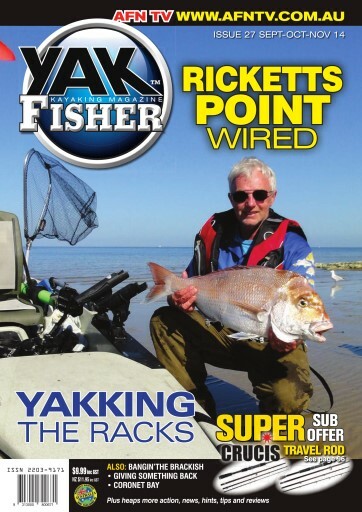 One of the most popular places in Port Phillip Bay for yakkers to catch a snapper is Ricketts Point and Mark Shearn covers the tactics and gives you the low down on the up coming season. Andy McGovern looks at the great fishing in the brackish for bass and perch, while Owen McPaul covers bream on the racks. There's plenty of news, gear and a great guide to Coronet Bay in Victoria's Western Port.